It continuously surprises us when potential clients don’t understand why a custom CMS is necessary for the more complex Web projects out there. Make no mistake, pre-made CMS solutions continue to be widely available, with commercial solutions like WordPress, Joomla, Magento, and Drupal taking up a majority of the CMS market share. But as businesses move toward a more content-heavy marketing approach, the need for tailor-made systems arises—and that's where custom solutions shine. If you're among the many businesses with a complex website looking for such tailor-made solutions, here are five things you should look for in a custom CMS developer. The single biggest advantage in a custom CMS is in its name: the ability to customize it specifically for your business needs. Most, if not all pre-made solutions come with a plethora of features, requiring customers to pay for attributes they will never need. Not to mention that if the built-in features don’t do what you need them to do, you will need to spend time and money bending them to your will. It's not difficult for us to make the educated guess that the reason custom CMS alternatives are rising in popularity is because of just how customizable they truly are. But that brings up an important point: don't just believe any developer who claims to give you a custom CMS. They may still build their software on a platform like WordPress or Drupal, which means that it's bound to the same restrictions and limitations that you're trying to get away from. The right custom CMS developers for your needs build your software from scratch. They may take inspiration or even individual features from the popular commercially-available tools, but the solution you end up with should be truly custom, designed and developed to fit your individual needs and wants. Custom CMS developers should always have expertise in all commercially available alternatives. This expertise allows them to adjust their strategies and practices on proven success strategies, without sacrificing the customization advantage of their own services. They may not use Magento or Joomla to develop your solution, but they should absolutely know how these CMS alternatives are built, along with their various advantages and disadvantages. In addition, your CMS developer should have a rich portfolio of previously build content management systems. Too often, business owners run into software developers who look at CMS building as yet another easy-to-develop type of software. But as you probably know, a good CMS can be so much more. Done right, it pulls your marketing together, integrating the content on your website with your other digital marketing strategies. Only a developer who knows the reach and potential impact of a successful CMS solution can deliver you a high-quality product. Don't just pick a software designer who has heard the words "Content Management System" before. Instead, go with a true CMS expert, both in terms of understanding the industry and competitive landscape and with the proven expertise to develop a solution that's perfect for your needs. In custom CMS building, the traditional step-by-step process of software development does not (and should not) apply. After all, you are looking for a solution that fits your specific business needs, so it only makes sense for you to be involved in the entire process from beginning to end. That's why a good custom CMS development firm should always subscribe to the agile philosophy of Web development. In case you're not aware, "agile" has developed as an alternative to the step-by-step process we mentioned above, often referred to as "waterfall" development. An agile developer does not approach projects on a step-by-step basis, in which they would complete individual parts of the project one after the other, before testing the software right before the finish line. Doing so means potentially sacrificing valuable resources, a lack of involvement from the client, or even running out of time at the end—which, in turn, generally leads to a lack of testing before handing off the project. Instead, agile developers break down the project into multiple "blocks," which are developed simultaneously. Each of these blocks receives its own team, has its own processes attached, and gets tested on its own. Going with "agile" over "waterfall" brings with it several advantages. For starters, agile development leads to a high degree of collaboration between developer and client, who can be involved in each chunk or "sprint" of the project. Because each of these chunks is tested on its own, the quality of the finished product increases. And the more flexible timeline means the project has a greater chance of being completed on time, at a lower budget. Agile development is a viable alternative for all types of software solutions, but particularly crucial in custom CMS development. Throughout this post, we've been stressing the importance of a truly custom solution developed specifically for your needs. If your CMS developer is agile, your input in the project increases significantly, ensuring that the individual needs of your business are truly met. Lightning Round: Where will you need to access your CMS? The answer might not be as easy as you think. 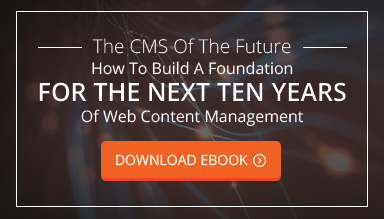 Sure, your (and your employees') work computers will be the number one spot, so any CMS has to be developed for desktop use. But beyond that, the answers get more muddled. You may conduct business at home, which means your content needs to live in the cloud to be easily accessible and transferable. You may do the same while traveling, which adds mobile capability to the list of necessities for your new CMS solution. Increasingly, businesses large and small need a CMS solution that is 'omnichannel' ready, meaning that its users can access and edit content and all features regardless of their location or the device they use. Of course, it's also important to keep the advantages of custom CMS development in mind. To keep the software lean and usable, you may want to think about the devices you'll be most likely to use, and focus on integrating those into your website's capabilities. Here, the advantage (and importance) of true customizability once again comes into play. But regardless of the exact functionality you need, your CMS developer should absolutely be able to deliver a product that integrates multiple channels. Finally, we get to an overarching philosophy we have not just about CMS building, but all types of Web development. Too many developers regard their clients as just that—customers who need a product done, short-term relationships that are bound to come to an end as soon as the finished product is delivered. Of course, this type of short-term relationship carries with it a variety of disadvantages for everyone involved. Receiving input throughout the development process will not be as easy and straightforward as it could be, leading to a solution that may not be exactly what you're looking for. In addition, a good content management will stay with your company for years, but that doesn't mean you don't need adjustments as your business grows and your content marketing strategy diversifies. Where will you turn for these adjustments? The obvious answer is "to your developer," which is why we think it so important to treat our clients not as customers, but as partners. Custom CMS development is a process that requires close interaction between both parties, both during and after the development process, which is why it's so important to find a partner that can help you get your solution and stay with you to ensure continues satisfaction. And if you're looking for a developer who can deliver true customizability thanks to CMS expertise and an agile philosophy, who can integrate your CMS regardless of which channel you may use to access and edit your content, and who will keep you involved throughout the development process in a mutually-beneficial partnership, why not contact us! We'd love to have a talk about your needs and what we can do to get you the CMS you've been waiting for.